How precious is that inheritance! All around is there is change and decay, in our bodies, in the Earth God has given us. There is very little that seems “pure and undefiled” these days, but then again, the pure and undefiled on Earth were corrupted by sin LONG before our time back in the Garden of Eden. 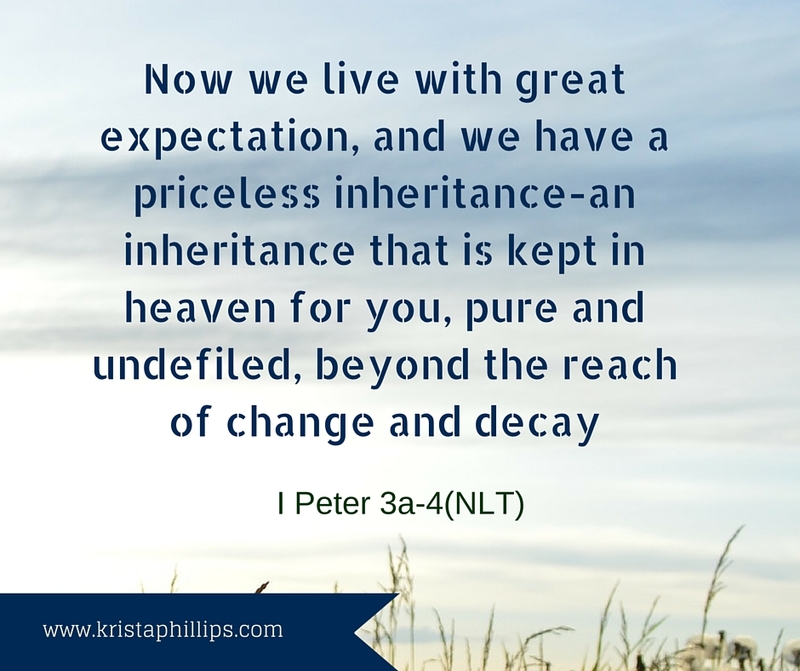 Sometimes it is easy to look around this world as a believer who yearns for the “pure and undefiled” that is promised and get down at all the corruption and decay — but this reminded me today that I only need to look heavenward in my heart and remember that my priceless inheritance is coming. Let us know for get that “great expectation” we have, even while we aim to do God’s work here in the midst of the decay.